Boys and boo boos go hand in hand. It doesn’t matter how overprotective I am, one of my boys usually get a scrap or bump during any outing we take. I used to get upset that my son was always the one to get hurt during play dates with friends. However, I was the only mom with a son. I guess girls don’t get hurt as often…or at least the ones I am around. Plus, my boys like to wrestle and do stunts…that they probably shouldn’t do . But boys will be boys. I call mine “my little superheroes.” And with that, I thought it would be fun to create this little Superhero Repair Kit (aka first aid kit) for my purse. That way I will be prepared to fix any scraps and cuts my little guys get will we are on the go. I have included a FREE printable on this post so you can make one too! 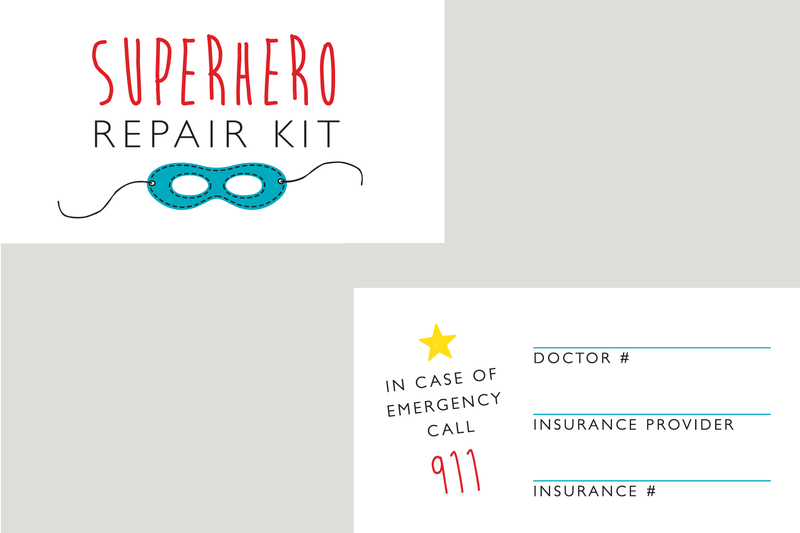 It is really simple to make your own Superhero Repair Kit. All you need is a little tin, and any first aid items you think you would need if one of your little superheros got hurt. You can also include some children’s pain pills, safety pins or small travel scissors, anything that you sometimes need in an emergency is great…as long as it is small and fits into your container. • First, print out the Superhero Kit Printable from your computer, or get it printed as a photo. I have it sized on a 4 x 6″ file, so you can easily get it printed at your nearest photo developer. • Cut out the printable (optional: round the corners of the cover ) and affix the cover image to the top of your container, and affix the emergency contact printable to the underside of the lid. I used double sided tape to affix mine. • Fill out the emergency contact printable with your information. • Fill your container with the first aid items you selected. Adding a non-perishable treat is great for those unconsolable non-emergent injuries. • Close your Superhero Repair Kit and store it in your purse or diaper bag. It’s funny, now I think my boys try to get hurt just so I can use my Superhero Repair Kit on them. They all have their own in their backpacks…”just because.” I guess it makes them feel special, even though it really just contains your average bandaids and a treat. I love my little superheros.